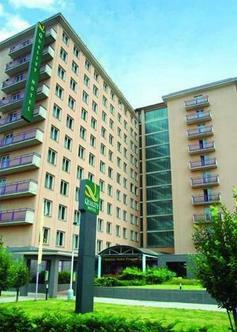 The hotel is situated in quiet Prague 10, ideally locatedin abusiness/leisure district. The city centre can beeasily reached bypublic transport within 15 minutes. Allfamous sites can be reachedwithin five minutes. Thirtyminutes' drive from the Airport Ruzyne.244 single, double,three-bedded rooms with satellite TV, phone,bathroom withshower and toilet. 200-seat restaurant featuring Czechandinternational specialties, 80-seat cafe bar with terrace.Fourvarious connectable conference rooms for up to 150delegates.Internet terminal in the lobby. WIFI in allpublic areas. Securedparking for cars and busses. Requiredextra bedding is free in roomsshared by up to two children12 or under and twoparents/grandparents.